No Matter the Topic, it's All About Boog: Upcoming Book Review! I was very honored to have been contacted by Judson Press recently to review a new book, "The Spiritual Art of Raising Children with Disabilities" by Kathleen Deyer Bolduc. This is a subject that so many parents of special needs children struggle with. It's like one of my favorite quotes, "I know God only gives me what I can handle...I just wish He didn't trust me so much". :) I find myself thinking that a lot when we're driving to multiple places for therapy and I catch a Facebook post of someone I went to school with. But seriously, don't we all have those moments? I'm very excited to dive into this book for some much-needed tips on taking care of myself while still making sure everyone else is fine spiritually, mentally, physically and emotionally! Author Kathleen Deyer Bolduc knows these feelings from experience. She and her son navigated through his childhood and now approach yet another new life phase -- adulthood -- and all that entails. 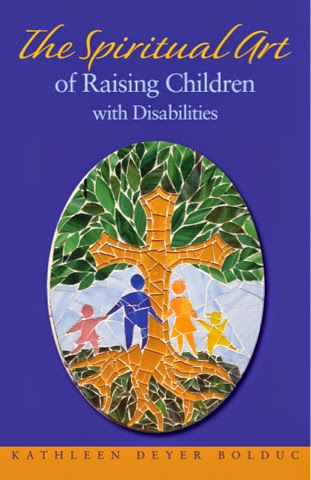 In The Spiritual Art of Raising Children with Disabilities, Bolduc uses the metaphor of the mosaic to life as parents of children with disabilities. How do you rearrange the fragmented and chaotic pieces of your family into a perfectly whole and beautiful work of art? Readers are walked through the process using the spiritual disciplines to help you recognize God's presence in your life and regain the balance we all need. Provides a unique perspective of a parent raising a child with disabilities -- and dealing with it through faith and spiritual direction. Powerful, insightful, faith-inspired stories of other families who are walking similar paths. Exercises at the end of each chapter allow readers to reflect to find the beauty in the pieces of their mosaic. Stay tuned for a full review! !